Posted 11 October 2013 & filed under Agriculture, Work. Jack and Sarah Stratton were the grandparents of Beryl Whitney. 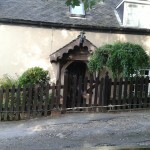 Flint Cottages were owned by Hedges Farm where, Beryl says, Jack was head cattleman for over twenty years. 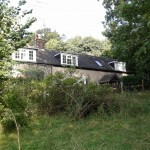 He and his family lived at 1 Flint Cottages from the 1920s through to his retirement in the 1940s. Beryl writes ‘The grand lady in the photo is my grandma and I have more memories of my time there. There was no bathroom and it was an outside toilet (no flush). There was no gas or electricity for heating or cooking, it was only oil lamps and candles. There was a brick shed at the back with a big copper which was heated for washing. I remember going with my brother into the woods at the bottom of the garden to collect wood for the fire. In the back garden we had a wood/coke burning stove which was used when making jam or cooking Christmas puddings. They kept about six chickens and two pigs in the yard. My Grandmas made quite a selection of wines and my sister and I spent hours collecting daisy and dandelion heads for her’. John and Sarah Stratton are listed in the 1911 census for Flint cottages. He was described as a cowman on the farm (Hedges Farm). They had seven children. In No. 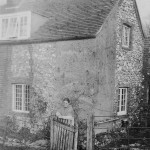 2 Flint Cottages, was the Jakeman family: Henry Edward, cowman on farm, his wife Alice and two small daughters. Mrs Sara Stratton pictured outside No. 1 Flint Cottages sometime in the 1920s.